For many students who attend Florida Agricultural and Mechanical University (FAMU), the Hill will not be their last stop in their collegiate career. As students matriculate through undergraduate degree programs, they often begin to consider pursuing graduate and professional degrees. This is where the School of Graduate Studies and Research comes in. Last week, Graduate Studies hosted its annual Graduate Feeder Conference to aid students in finding graduate schools that would not only be the perfect match academically, but also financially. The Graduate Feeder Program boasts partnerships with 40 universities nationwide including Cornell University, Northwestern University, Purdue University, and UCLA. By participating in the Feeder program, students are given the opportunity to have their graduate education paid in full by top schools and are eligible to receive up to $12,000 in a stipend. This year’s two-day Feeder Conference included workshops that featured speakers from various partner universities in addition to a recruitment fair where students were able to interact one-on-one with representatives from the attending institutions. Terrance McNeil, Graduate Feeder Program coordinator, said he was ecstatic that many of the workshops had standing room only because students were able to receive a better understanding of what the various graduate programs can provide. McNeil said the record attendance at this year’s Feeder Conference is a sign that more students are taking an interest in continuing their education after they leave FAMU. “We are extremely focused on ensuring our students take advantage of every opportunity available to them in terms of funding,” McNeil said. “Many students want to obtain a graduate degree, but don’t know how they’re going to pay for it. This program will help solve that issue. When our students earn graduate degrees, they are not only contributing to the upward mobility of themselves, but also the Black community as a whole,” McNeil said. Javoni Cobb, who studies psychology with a minor in English literature, plans to begin graduate school in the fall of 2017. Cobb said the conference opened her eyes to the various avenues that are available for students when choosing graduate programs. “During one of the workshops I attended, the speaker encouraged students to consider programs that they may not have initially associated with their undergraduate degree, and I never really thought about that,” Cobb said. “I highly suggest that students attend conferences like this and get involved with the program in general because it allows you to make connections early on, so that by the time you graduate you already know where you’re going,” she added. To participate in the Graduate Feeder Program, students are required to have at least a 3.0 GPA and submit an application. 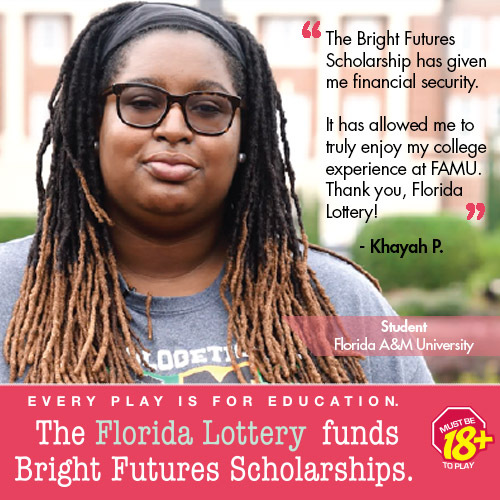 For more information about becoming a Feeder Scholar, visit www.famu.edu/graduatestudies. The Florida A&M University School of Allied Health Sciences Division of Physical Therapy Second White Coat Ceremony Perry-Paige Auditorium Friday, April 26, 2019 5 p.m. – 7 p.m.